Angkor Wat is a temple complex in Cambodia and the largest religious monument in the world, with the site measuring 162.6 hectares (1,626,000 sq meters). It was originally constructed as a Hindu temple for the Khmer Empire, gradually transforming into a Buddhist temple toward the end of the 12th century. It was built by the Khmer King Suryavarman II in the early 12th century in Yaśodharapura, the capital of the Khmer Empire, as his state temple and eventual mausoleum. 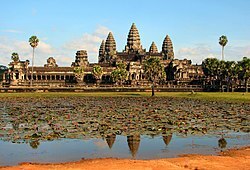 Stretching over 500 acres the Angkor Wat temple in Cambodia is the largest religious structure in the world. It is a UNESCO world heritage site and icon of Cambodia. The center tower of the temple stands at a height of 65 meters is surrounded by four smaller towers. The main entrance of the Angkor Wat on West side has rich decorations with sculptures and carvings. There is also a 3.2 meters high statue of Lord Vishnu made of sandstone. The central complex of Angkor Wat is a three storey structure.There are three main galleries in the central complex of the temple. Each gallery also has a lotus-bud shaped tower. The gallery of thousands Buddha houses hundreds of images of Lord Buddha. The inner wall of Angkor Wat is also decorated with important scenes from Hindu epics Ramayana and Mahabharata. The Sri Ranganathaswamy Temple is a Hindu temple dedicated to Ranganatha, a reclining form of Hindu deity, Vishnu located in Srirangam, Tiruchirapalli, Tamil Nadu, India. Constructed in the Dravidian style of architecture, this temple is glorified in the Thiviya Pirabandham, the early medieval Tamil literature canon of the Alvar saints from the 6th to 9th centuries AD and is counted among the 108 Divya Desams dedicated to Vishnu. The temple follows Thenkalai tradition of worship. 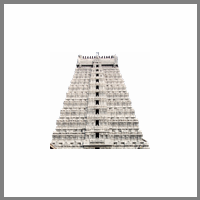 Sri Ranganathaswamy temple is the most famous and largest Hindu temple in India. This magnificent Vishnu temple is also one of the finest Dravidian religious structures in India. The inscriptions from Sri Ranganathaswamy temple describe the role of Different dynasties including Chola, Pandya, Hoysala and Vijayanagar in the restoration and renovation of the temple. There are 21 towers and 39 pavilions in Sri Ranganathaswamy Temple. At height of 236 feet main gopura of the temple known as Rajagopuram is the second tallest temple tower in Asian continent. The temple comprises seven enclosures formed by thick walls. The rampart wall encircles the golden plated main sanctum of the temple. The inner five prakaras as function as temple and the Non-Hindus are not allowed to enter main sanctum of the temple. Akshardham or Swaminarayan Akshardham complex is a Hindu mandir, and a spiritual cultural campus in New Delhi, India. The complex displays millennia of traditional Hindu and Indian culture, spirituality, and architecture. Hindu temple after the Akshardham in Gandhinagar both inspired and developed by Pramukh Swami Maharaj, the spiritual head of the Bochasanwasi Shri Akshar Purushottam Swaminarayan Sanstha, whose 3,000 volunteers helped 7,000 artisans construct the temple. The Akshardham temple complex is entirely made of sandstone and marble. The magnificent gajendra pith of the temple symbolizing the animal kingdom. It features 148 full sized elephants, 42 birds and 125 human sculptures carved in pink stone. The 1070 feet long gajendra pith also represents a deep relation of ancestors of India and with nature. 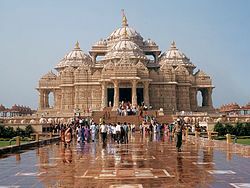 The main monument of Akshardham temple consists of 234 carved pillars and nine domes. The carvings of detailed information about Hindu deities, plants, animals and arts also can be found inside the monument. Belūr Maṭh or Belur Mutt is the headquarters of the Ramakrishna Math and Mission, founded by Swami Vivekananda in 1897, a chief disciple of Ramakrishna Paramahamsa. It is located on the west bank of Hooghly River, Belur, West Bengal, India and is one of the significant institutions in Calcutta. This temple is the heart of the Ramakrishna Movement. The temple is notable for its architecture that fuses Hindu, Christian and Islamic motifs as a symbol of unity of all religions. The most interesting feature of Belur math is it look like a temple, church or a mosque from every angle.“The spiritual light that this place will emit will flood the whole universe” Swami Vivekananda said on the occasion of laying the foundation stone of Belur Math in 1898. The entire complex of Belur math covers an area of 40 acres. The Belur Math complex contains temples dedicated for Sri Ramakrishna, Swami Vivekananda and Holy mother, Sri Sarada Devi. The main gate of the temple contains symbols of different religions. The museum of the Belur math also contains different artifacts used by Sri Ramakrisha and Swami Vivekananda. Thillai Natarajah Temple, Chidambaram or Chidambaram temple is a Hindu temple dedicated to Lord Shiva located in the town of Chidambaram, East-Central Tamil Nadu, South India. The temple is known as the foremost of all temples to Saivites and has influenced worship, architecture, sculpture and performance art for over two millennium. The Sangam classics list chief architect Viduvelvidugu Perumthachchan as directing an early renovation of the shrine. The historic Hindu temple spread across 50 acres. The sanctum also contains images of Lord Shiva and Goddess Parvathy. The temple was renovated by rulers of different dynasties including Pallava, Chola, Pandya, Vijayanagara and Chera in different period of time. According to the hypothetical believes the Nadaraja temple is located in the lotus of the universe known as ‘virat hridhaya padhma sthanam’. There are four main gopuras standing at a height of 250 feet and face four different directions. The magnificent towers are also decorated with 108 different poses of Bharata Natya and with images of Hindu mythology. Candi Prambanan or Candi Rara Jonggrang is a 9th-century Hindu temple compound in Central Java, Indonesia, dedicated to the Trimurti, the expression of God as the Creator (Brahma), the Preserver (Vishnu) and the Destroyer (Shiva). The temple compound, a UNESCO World Heritage Site, is the largest Hindu temple site in Indonesia, and one of the biggest in Southeast Asia. It is characterized by its tall and pointed architecture, typical of Hindu temple architecture, and by the towering 47-metre-high (154 ft) central building inside a large complex of individual temples. Prambanan attracts many visitors from around the world. The Prambanan compound also known as Rara Jonggrang complex, named after the popular legend of Rara Jonggrang. There were once 240 temples stood in this Shivaite temple complex, either big or small. Today, all of 8 main temples and 8 small shrines in inner zone are reconstructed, but only 2 out of the original 224 pervara temples are renovated. The majority of them have deteriorated; what is left are only scattered stones. Brihadeeswarar Temple locally Known as Tanjai Periya Kovil is a Hindu temple dedicated to Shiva located in Thanjavur in the Indian state of Tamil Nadu. It is one of the largest temples in India and is an example of Tamizh architecture during the Chola period. Built for Raja Raja Chola I and completed in 1010 CE, the temple turned 1000 years old in 2010.The architect and engineer of the temple, Kunjara Mallan Raja Raja Perumthachan is revered today as a father figure to all craftsmen in his homeland of present-day Central Kerala. The temple is part of the UNESCO World Heritage Site known as the "Great Living Chola Temples". The temple stands amidst fortified walls that were probably added in the 16th century. The vimanam is 100 ft (30 m) high and is the tallest in the world. There is a big statue of Nandi (sacred bull), carved out of a single rock measuring about 16 ft long and 13 ft high at the entrance. The entire temple structure is made out of granite, the nearest sources of which are about 60 km to the west of temple. It is the world's 1st complete "granite" temple. The temple is one of the most visited tourist attractions in Tamil Nadu. Annamalaiyar Temple is a Hindu temple dedicated to the deity Shiva, located at the base of Annamalai hills in the town of Thiruvannamalai in Tamil Nadu, India. It is significant to the Hindu sect of Saivism as one of the temples associated with the five elements, the Pancha Bhoota Stalas, and specifically the element of fire, or Agni. Shiva is worshiped as Annamalaiyar or Arunachaleswarar, and is represented by the lingam. The presiding deity is revered in the 7th century Tamil Saiva canonical work, the Tevaram, written by Tamil saint poets known as the nayanars and classified as Paadal Petra Sthalam. The 9th century Saiva saint poet Manikkavasagar composed the Tiruvempaavai here. The temple complex covers 10 hectares, and is one of the largest in India. It houses four gateway towers known as gopurams. The tallest is the eastern tower, with 11 stories and a height of 66 metres, making it one of the tallest temple towers in India. The temple has numerous shrines, with those of Annamalaiyar and Unnamulai Amman being the most prominent. The temple complex houses many halls; the most notable is the thousand-pillared hall built during the Vijayanagar period. Rajagopalaswamy temple is a Vaishnavite shrine located in the town of Mannargudi, Tamil Nadu, India. The presiding deity is Rajagopalaswamy, a form of Lord Krishna. The temple is spread over an area of 23 acres (93,000 m2) and is one of the important Vaishnavite shrines in India. The temple is called Dakshina Dwarka (Southern Dwarka) along with Guruvayoor by Hindus. The image of the presiding deity is 156 Feet tall. There is a big tank at the entrance of the shrine where rain water is collected. The temple complex has 16 gopurams (tower gateways), 7 prakarams (outer courtyard), 24 shrines, seven mandapams (halls) and nine sacred theerthams (temple tanks). The utsava (festival deity) is a bronze figure from the Chola period. It shows keshabanda type of coifure and restrained ornamentation, atypical of the Chola bronzes of the 11th century. The temple tank is called Haridra Nadhi, 1,158 feet long and 837 feet broad (23 acers), making it one of the largest temple tanks in India. Ekambaranathar Temple or Ekambareswarar Temple is a Hindu temple dedicated to Shiva, located in Kanchipuram in the state of Tamil Nadu, India. The temple is the largest temple in the town of Kanchipuram and is located in the northern part of the town. The temple gopuram (gateway tower) is 59m tall, which is one of the tallest gopurams in India. It is one of the five major Shiva temples or Pancha Bootha Sthalams (each representing a natural element) representing the element - Earth. The other four temples in this category are Thiruvanaikaval Jambukeswara (water), Chidambaram Natarajar (Sky), Thiruvannamalai Arunachaleswara (fire) and Kalahasti Nathar (wind). It is one of the 275 Paadal Petra Sthalams, where all of the four most revered Nayanars (Saivite Saints) have sung the glories of this temple. The temple is one of the most prominent tourist attractions in the city.